Colette Weidl only once held her baby Henry in her arms.The tender moment, captured in stark black and white, now sits framed in her living room. Colette Weidl only once held her baby Henry in her arms. Cradling his tiny head in her hands, she cried. Henry had been stillborn only hours before. That tender moment is captured among a handful of black-and-white photos, framed and on display in the living room of her Beaumont home. Those images are some of Weidl's most cherished possessions. "He is still part of my family," Weidl said. "Just because he's not physically here, he's always spiritually here. He is my fifth child." When Weidl woke up to blood-soaked sheets on April 26, 2014, she assumed her baby boys — fraternal twins — would be born premature but healthy. She was 36 weeks pregnant. She hadn't experienced any complications during her pregnancy. "In my naive mind, I wasn't thinking the worst. I just thought, 'We're having babies today.'" Weidl rushed to the hospital where she had an emergency C-section. "The nurses and doctors [were] panicking," Weidl recalled. "That's when I started to feel that rush, something is wrong." When Weidl awoke from surgery, she remained in a fog of anesthesia and pain medication. She struggled to maintain consciousness or to make sense of what was happening. "I woke up and my husband was holding a baby," she said. "I was in and out a lot but I would only see one baby. And then my husband came by my side and told me that news that one didn't make it." Henry, the child she had not seen in her husband's arms, was dead. Her memories of the hours that followed remain blurry. Weidl was numb, in shock. It would take days before the gravity of the loss would feel real. When a hospital social worker offered to arrange a remembrance photography session, Weidl was uncomfortable with the idea but too dazed to decline. Weidl was placed in a private room outside the maternity ward where she met with Edmonton-based photographer Carlin Getz. 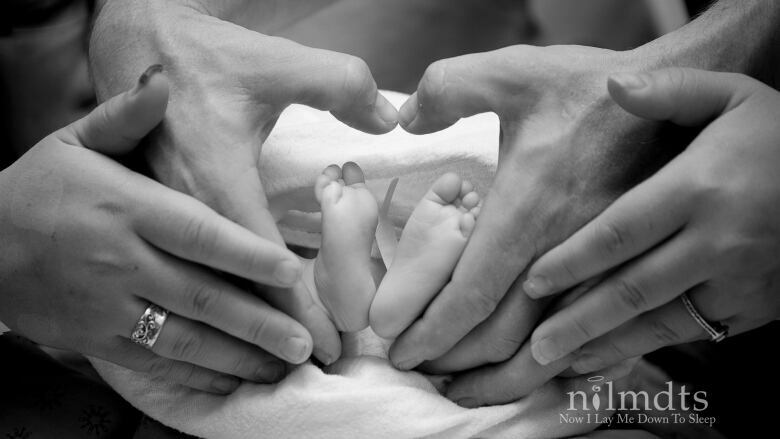 Getz is a volunteer with Now I Lay Me Down to Sleep, an international group of volunteers who offer professional portrait services of babies who were stillborn or died shortly after birth. "She was just such a warm person. And she took my baby and held him like he was there, alive," Weidl said. "If this was not a program, I wouldn't have these beautiful pictures. I would have regretted saying no. I'm very grateful." Now I Lay Me Down to Sleep, a Colorado-based non-profit organization, was founded by Mike and Cheryl Haggard in 2005 following the death of their baby boy, Maddux. The child was born with a condition called myotubular myopathy which prevented him from breathing, swallowing, or moving on his own. On the sixth day of Maddux's life, before life support was removed, his parents asked a photographer to capture a portrait of their son. Since being founded, the organization has expanded into hospitals and maternity wards across North America. In Alberta, an increasing number of families are finding solace in remembrance photography, Getz said. "These photographs are some of the most precious and tangible ways that they can remember their babies," Getz said. "If me walking into a room and taking pictures gives them the freedom to talk about the baby that they prayed for, that they hoped for … I think that in itself is the catalyst for them to move forward through that healing process." Getz can get the call at any time. When it comes, she packs up her gear, heads to the hospital, and walks into a new family's nightmare. She has been with the organization since 2008 and also helps manage volunteer photographers internationally. She got involved after suffering a miscarriage. "As a mom, the minute you take the pregnancy test, all of sudden this whole future opens up before you," she said. "When I lost that little one, I was distraught because I lost a piece of the future that I had envisioned. I got on the internet and looked for ways to give back and came across Now I Lay Me Down to Sleep." Giving comfort to grieving families has helped Getz cope with her own loss. "It is an amazing experience but one that's weighed very heavily on my heart," she said. "In my own silly little way, they are my babies, too. I love being able to cuddle them and love them and whisper over them. "It's a way of honouring the little baby that I never got to hold. It gives me peace." The two women have since become friends, bonded by the shared experiences of loss. For Weidl, the photographs have been an important part of her journey to grieve and to honour the child she lost. "You're going to want to look back," Weidl said. "Once you are ready, they are there for you."